Francis Marion, known as "The Swamp Fox," was born at his family's South Carolina plantation in Berkeley County. A man of his time, he owned slaves and fought in the French and Indian War. While fighting against the Cherokee, he saw those Native Americans using landscape as a kind of weapon. After concealing themselves in the backwoods, they launched crushing ambushes. During America's war of independence, Marion used those same tactics against the British Army. As a result, some historians call Marion the father of guerilla warfare. In 1775, Marion was elected to South Carolina's Provincial Congress (whose members favored a break with Britain). Sent to guard artillery and build the fort on Sullivan's Island, Marion was one of that island's defenders during the battle of June 28, 1776. Later that year, on the 16th of September, he was promoted to Lieutenant Colonel Commandant of the Second South Carolina Regiment. After the fall of Charleston, in 1780, the war's outcome looked bleak for America. Remembering what he had learned from the Cherokee, Marion led a group of fifty militiamen in a raid against the Redcoats. Emerging from their hiding place, in dense foliage, Marion's men attacked the enemy and rescued American prisoners. Marion led more such raids, employing similar tactics. Soon he and his men were causing the British to divide their forces since they never knew where Marion was - or when he would strike. In November, of 1780, an escaped prisoner told Lt. Colonel Banastre Tarleton where Marion and his men were located. For seven hours, the British leader and his troops had their sights on Marion, covering twenty-six miles in the hunt. As for this damned old fox, the Devil himself could not catch him. Thus was born Marion's nickname, "The Swamp Fox." Although he never led a large force, or commanded troops in a major battle, Marion's daring and determined efforts kept hope alive in the South. After the war, when he was fifty-four years old, he married his cousin, Mary Esther Videau. She was forty-nine. Serving in the South Carolina Assembly, Francis helped to write the state's constitution and favored amnesty for Americans who remained loyal to Britain during the war. He died at his plantation on the 27th of February, 1795. Marion owned slaves. One of them was Oscar Marion. Oscar was honored, in December of 2006, when America's president signed a proclamation recognizing the man whom Marion's biographers call "the faithful servant, Oscar." Because Oscar, who was Marion's personal servant, would have fought alongside the Swamp Fox, President Bush publicly expressed thanks on behalf of a "grateful nation" for Oscar's "service ... in the Armed Forces of the United States." Mezzotint image of Marion, Library of Congress. Information and quotes, South Carolina Department of Archives and History. 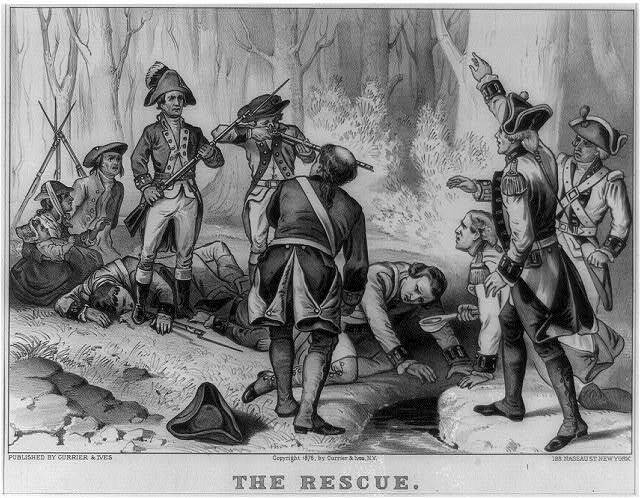 Linked above: Print ("The Rescue") depicts Sergeants Newton and Jasper, of Marion's Brigade, rescuing American prisoners from the British. Published by Currier & Ives, c. 1876. Library of Congress. Bos, Carole "Francis Marion, "Swamp Fox"" AwesomeStories.com. Jun 22, 2013. Apr 19, 2019.